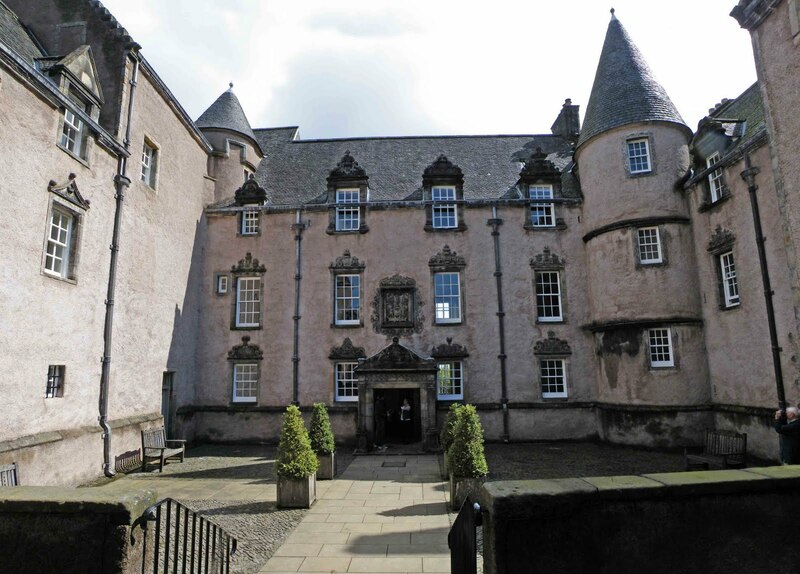 This beautiful Stirling town house can be found on Mar Place, a few yards from the bottom of the castle esplanade. It is a gem of a building...reputedly the most complete example of a 17th century town house in Scotland. It is included here on this web site as it is mentioned in Martin Coventry's The Castles of Scotland...firmly placing this building in the Tower House category of residences. Whether or not it was ever built with defence in mind we'll probably never know...but it was most certainly a very high status building, giving its occupants easy access to the Royal court of Stirling Castle. The house started life as an L-plan tower house. Looking at the photos, the oldest and original part of the building is the left hand wing, the L-plan tower. This part of the building dates from the late 1500's, and appears to have been at the very least, a secure and safe haven for its occupants, having thick walls, a vaulted kitchen and a stair turret at the inside angle. The walls to the rear, the front and the sides of this original portion of the building, have only the smallest of original windows at ground and first floor level, another indication of the safety features built into its fabric. There is a large hall on the first floor, designed for entertaining guests, and the room incorporates huge cupboards which would have been opened when guests were visiting, so that the family's plate could be shown off. Above. A view into the courtyard. 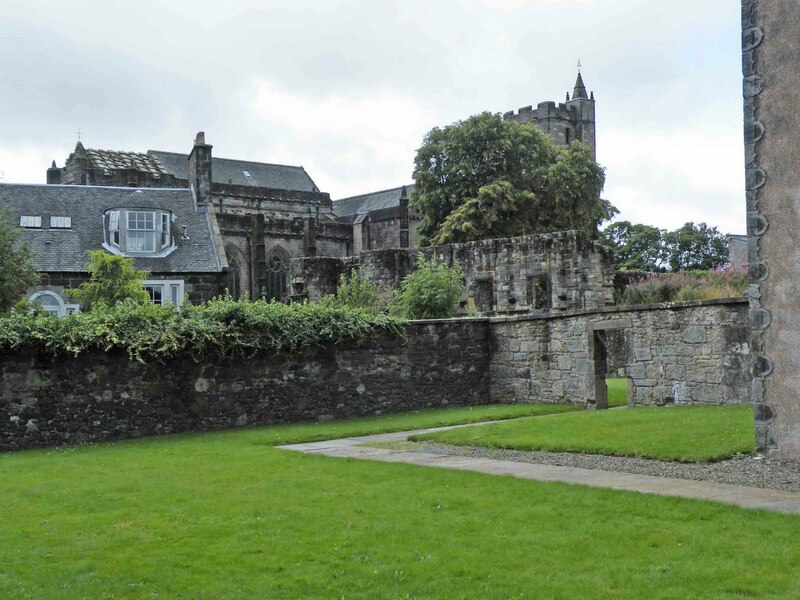 The L-plan was soon to be swallowed up by additions to the building, with various periods of extension taking place through the late 16th century and early 17th century. 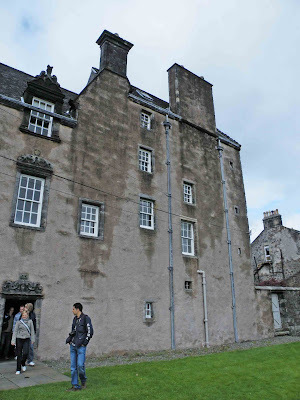 The original building was built by John Traill, a wealthy Stirling business man, but it soon passed to Sir William Alexander of Menstrie (1st Earl of Stirling and Viscount Canada) sometime during the 1630's. Sir William added his own touches to the building during his tenure, including finely decorated suites of public and private rooms. 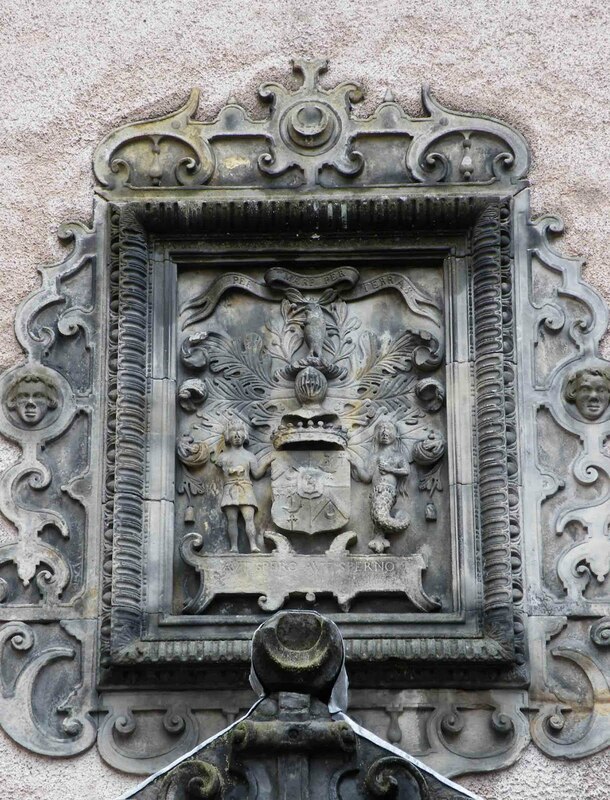 It then passed to the Campbell Earls of Argyll after William became bankrupt, around 1640, and it was they who were responsible for the next phase of building. Above. The right hand, and newer turret in the courtyard. 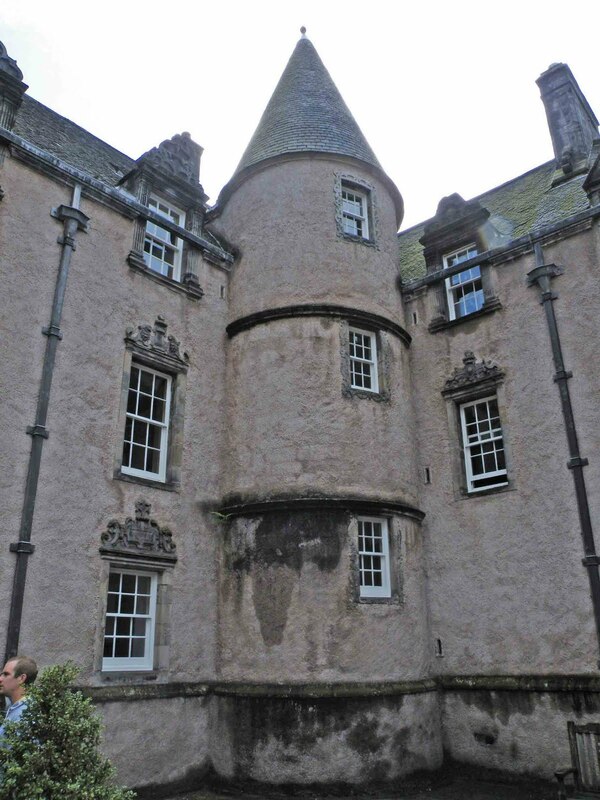 The 9th Earl of Argyll expanded the property even further, building the turrets in the courtyard that display a French influence with their conical roofs. 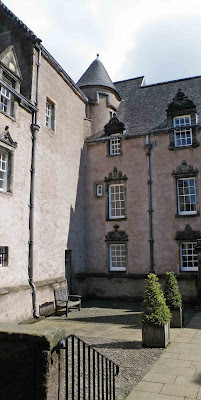 The Earl of Argyll expanded the building to the North and the South, and built the fine courtyard to the front of the property. The surviving painted decoration in the High Dining Room is from this period, and is an indication of the decoration that may once have been present in other parts of the building. Above. 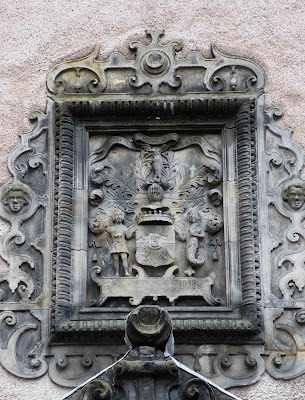 The heraldic panel over the door. The Earl of Argyll was executed in 1680 for refusing to accept Royal authority. The house and its contents were turned over to his wife upon his death. The house seems to have passed through the family, until, in 1764, it was sold by the 4th Earl of Argyll. It's a miracle that so much of the wood work, painted decorations and other original features are still here for us to see. Above. The rear of the original L-plan tower house. It became Crown Property, and so began a long period of non-domestic use. It was in use as a military hospital for many years, and even endured many visitors whilst it was employed as a Youth Hostel. Above. The ruins of Mar's Wark and Holy Rude church from the back garden. Above. The left hand, and original tower. 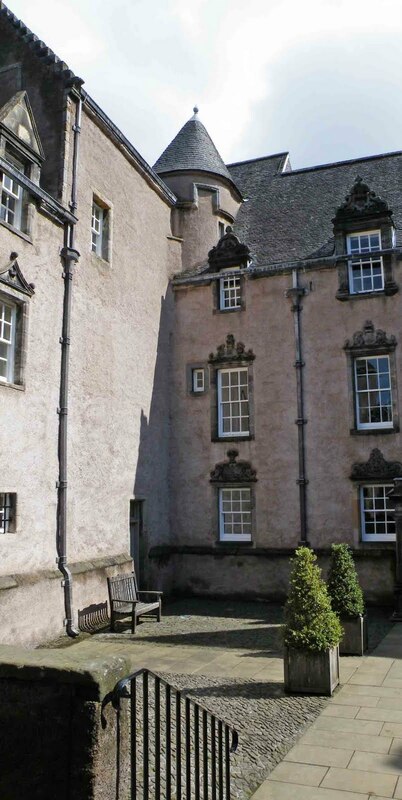 The house is now in the care of Historic Scotland, and through them tours can be arranged which allow you to see each and every room in the house. If you go to Stirling Castle, the tour is thrown in free when you pay for entrance to castle's grounds. It's well worth a visit and the tour guides are second to none...friendly, well informed and able to answer any questions. Above. Floor plan of the lodgings. Check this link out for further information on visiting Argyll's Lodgings.